Growing up in Vietnam in the 1970′s meant some hardships but exciting musical times for Dat Nguyen. The inspiration of great artists ranging from Andre Segovia to Carlos Santana started Dat on a long, hard, but fulfilling musical journey — one that was to lead him to becoming one of the finest young classical guitarists.In 1991, Dat came to the United States to further that dream. He found it difficult to assimilate with both a disability and the language barrier. Several of his original pieces reflect this difficult transition. His struggle was filled with unrelenting dedication but that eventually led to an entirely new life that included his acceptance to the California State University at Fullerton. Within his first 2 years, Dat had won 3 major guitar competitions: the Disney Creative Challenge Award, the California String Teacher Association Competition, and the National Panasonic Young Solo Artist Competition. 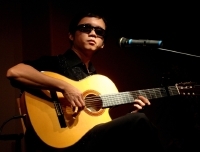 He was described by one of his professors as “The best young classical guitarist that I have ever instructed.” Combined with an interesting childhood and an adjustment to a new way of life here in the United States, both local and national press have featured Dat as one of their favorite new musicians. Dat plays a wide variety of music in his repertoire ranging from the most difficult of classical pieces to contemporary favorites to many of his own compositions. As a solo artist, Dat has performed at The Orange County Performing Arts Center, the San Francisco Conservatory, the University of Southern California, Rice University, and at private engagements for Southern California Edison, the Governor of California’s Committee for the Employment of Disabled Person’s Annual Awards Presentations and the annual conference of the National Music Merchants Association. During his college years Dat teamed up with other music-major friends to form Bayadera. Bayadera has become a nationally recognized touring band and has just released their second CD, Rotations of the Earth. Although fully a team effort, Bayadera recognizes Dat’s stand out ability as an artist who is blind. Frequently during their concerts they recognize Dat as a featured player and openly discuss issues relating to working and creating with those with a disability as exemplified during their annual appearance at the annual Festival of Human Ability at the Aquarium of the Pacific in Long Beach, California. Recently Bayadera and Dat accompanied Stevie Wonder at the 25th Annual Media Access Awards.